Single Chamber/Rate Hysteresis promotes intrinsic activity below the programmed Lower Rate. It prevents the device from overriding slow, but appropriate, intrinsic rhythms that may develop from extended periods of inactivity such as sleep. The feature is called Rate Hysteresis in Micra™, Advisa DR™ MRI, Revo MRI™, EnRhythm™, and all ICDs. It is called Single Chamber Hysteresis in all other pacemakers. For simplification purposes, it will be referred to here as Hysteresis. This feature can be found in some Medtronic Pacemaker and ICD devices. Please go to manuals.medtronic.com or consult with your local Medtronic representative regarding device models available in your geography. To program this feature in pacemakers, go to Params -> Additional Features -> Single Chamber Hysteresis. To program this feature in Pacemaker (Micra, Advisa, Revo, EnRhythm) and ICDs, go to Params -> Pacing… -> Additional Features -> Rate Hysteresis. Hysteresis is inoperative when the Sleep Function is operating and if the Sleep Rate is programmed to a rate equal to or lower than the Hysteresis Rate. Atrial Preference Pacing, Atrial Rate Stabilization and Ventricular Rate Stabilization cannot be enabled at the same time as Single Chamber Hysteresis. * Hysteresis is only available in VVI mode in Micra, and AAI or VVI modes in Advisa DR MRI, Revo MRI, EnRhythm and ICDs. 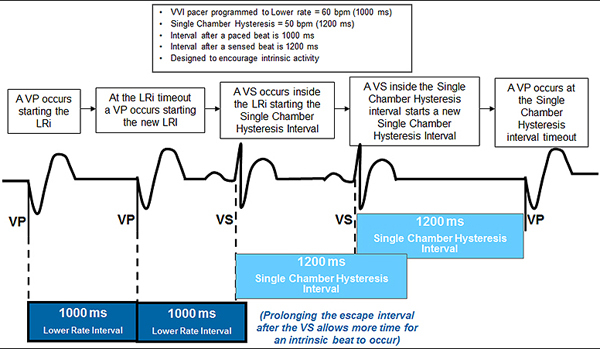 When Hysteresis is programmed, a sensed event temporarily suspends the Lower Rate, and the pacemaker determines its escape rate from the hysteresis rate instead. As long as the intrinsic rate remains above the hysteresis rate, pacing is inhibited. The first occurrence of an escape pace at the Hysteresis Rate suspends hysteresis operations and reestablishes the Lower Rate as the escape rate. The Rate Histogram feature indicates when the device has allowed the patient’s instrinsic heart rhythm to prevail at rates less than the programmer Lower Rate. 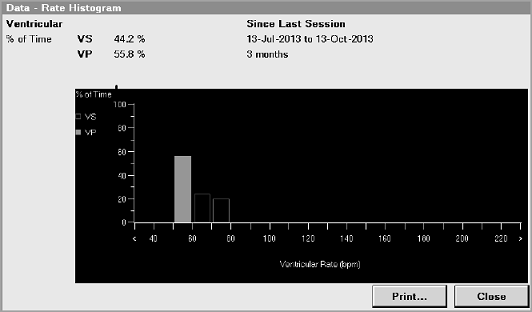 View the patient’s heart rates on the Rate Histogram screen and or report. Notice the column in the 50 – 60 bpm heart rate range. This represents the percentage of VS events occurring below the programmer Lower Rate as a result of Rate Hysteresis. Sources: Micra™ MC1VR01 Clinician Manual, Medtronic Adapta™/Versa™/Sensia™ Reference Guide; Medtronic Protecta™ XT DR Clinician Manual.